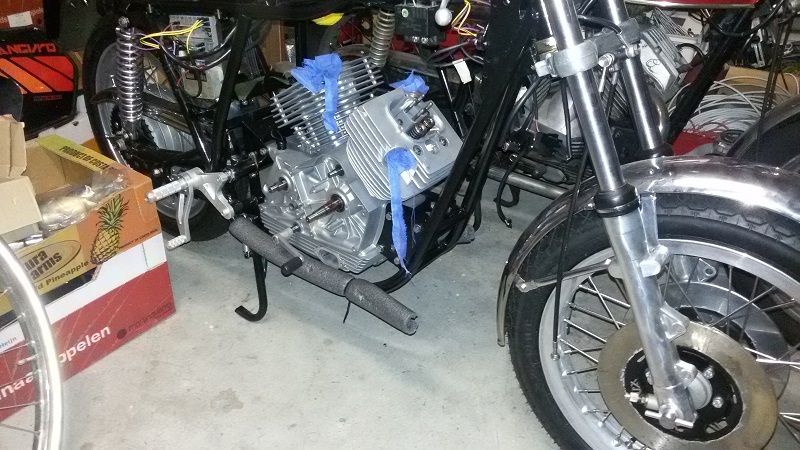 Meanwhile it is about time to work on the engine. 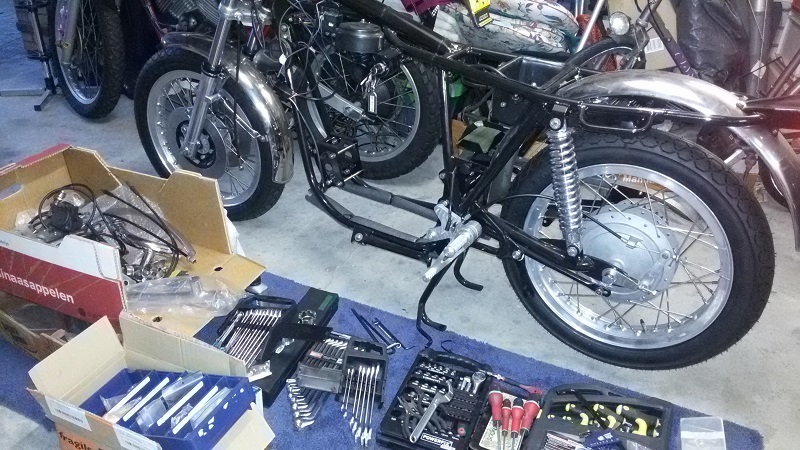 Not the final step, that will be adjusting the bike, check all connections, etc. 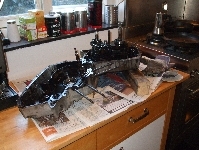 Before that the engine needs work. 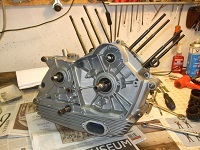 After problems opening the motor, it is now on the workbench of a friend. 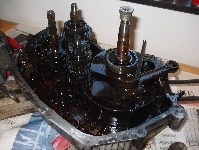 No need to say, apart from a good clean-up inside, it needs new bearings, etc. 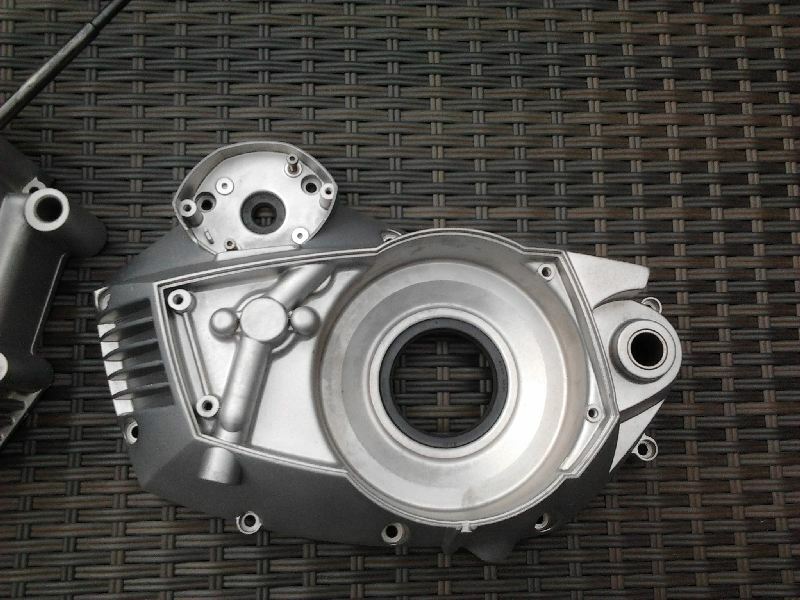 Also the crankcases need (wet?? )blasting on the outside. 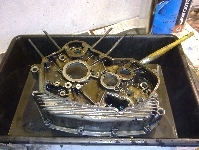 Last week my friend was successfull in taking out the crankshaft. The crankcases needed a slightly higher temperature in the oven. One allen bolt had to be drilled out. 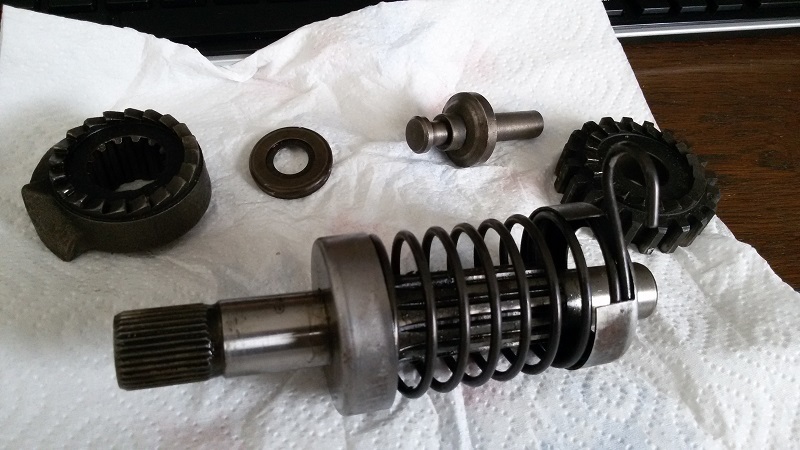 after some 'soaking', I'll clean the parts with a brush and old blunt screwdriver. finally I'll dry all parts with cotton clothes and store them. 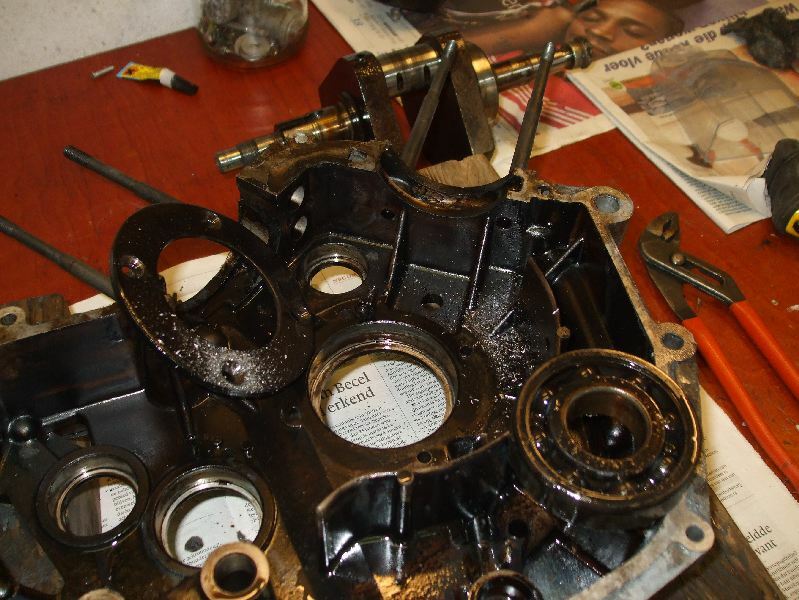 The black dirty scum has to be cleaned off the inner engine parts. On Sunday, 10 March I started the cleaning. Dirty job! I used a large bowl which I bought at an automotive shop. Also a good brush, special 'cold' cleaner, gloves chemical-proof. 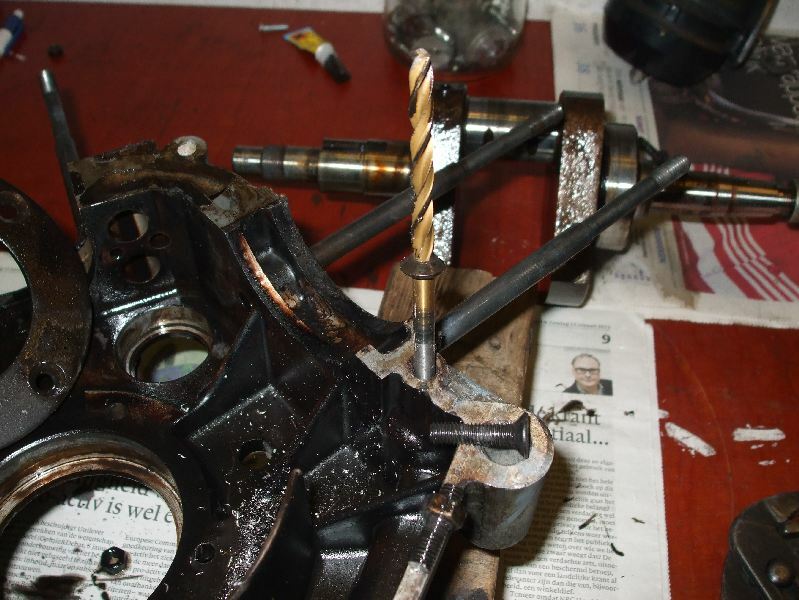 Note: when cleaning the engine parts with the pressure cleaner, I put the parts on wood. This prevents scratches from the stone tiles into the metal. Dirt and grease solved in the cold cleaner, as planned. 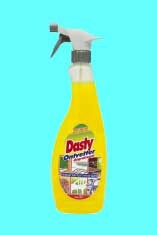 The final touch of the clean-up was achieved with "Dasty" a super degreaser. A local shop sells this stuff for the kitchen for less than 2 Euro's a bottle! 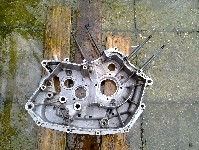 Above: after treatment with the pressure cleaner. Final result after using Dasty super-degreaser. 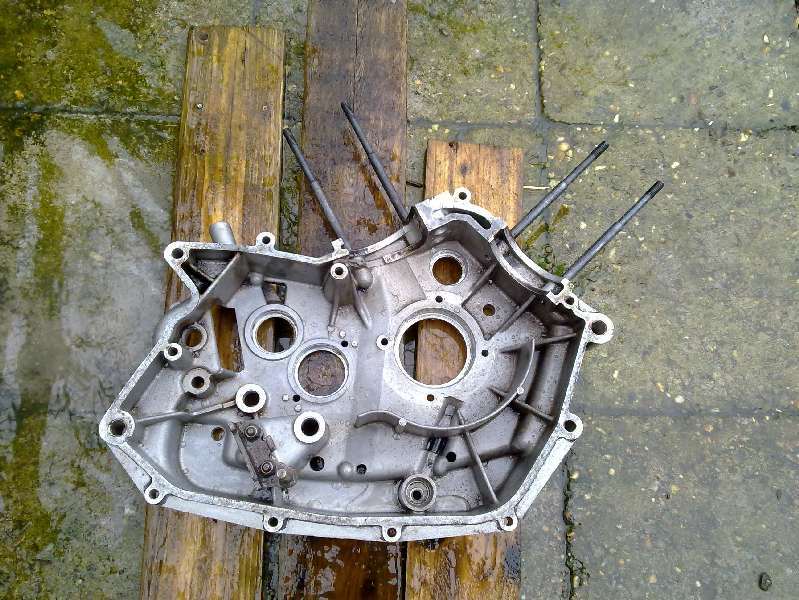 On Wednesday 9 October 2013 I received the engine cover parts back from Wetblast in Almere/Netherlands. Fantastic result!! I can fully recommend this cleaning process! The wetblast cleaning process closes the 'pores' in the metal surface. That way it cannot store dirt/grease. Fantastic base to build-up the engine. The Spring is the reason for a re-start of the project. 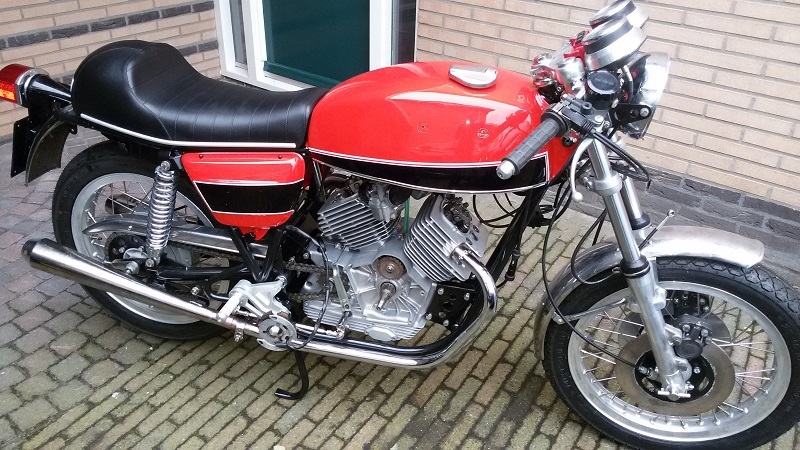 The last stages should now finish the restauration. 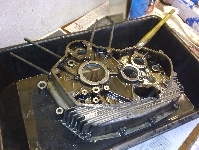 The engine is being rebuild with new bearings, seals etc. Wiring: connecting the wiring to a modern type CEV lightswitch on the wiring of the old type metal switch CEV 169. Fix the brake calipers, fill up with brake fluid, get the air out of the system. 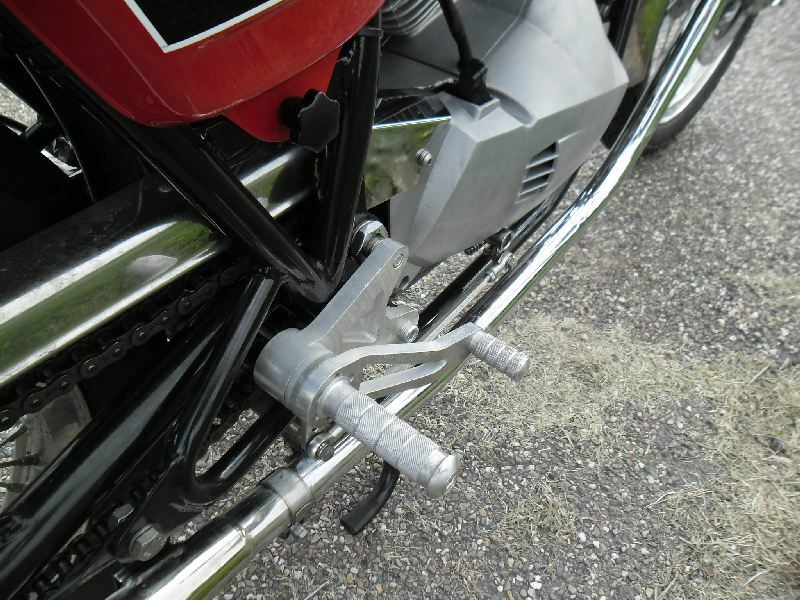 Connect/adjust the rearset (non-standard footrests). 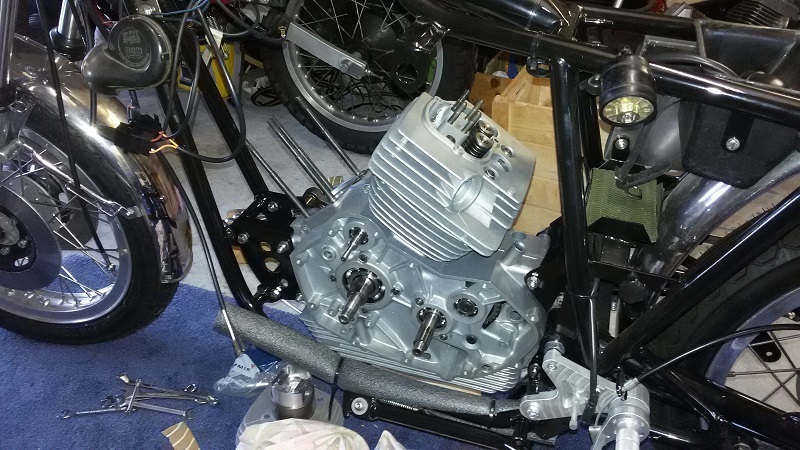 The carbs have to be sorted, the correct jets, needles, new gaskets. 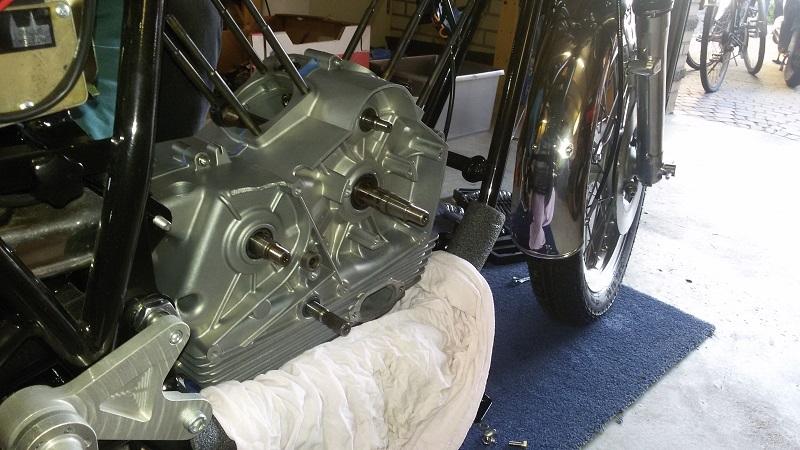 Check all bolts and nuts and thighten them. I want to replace the metal CEV lightswitch, type 169 (photo 1) for lights and horn, for a later/more modern type (photo 2). Inside the metal switch 5 wires are soldered for lights and horn (indicators through an external switch). On photo 3 the wiring ends for the metal CEV switch. 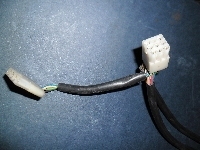 The later type switch has got two sets of in total 11 wires (photo 4) connected. These two sets each have their own plug. So how do I connect wires from the old wiring harness to the new switch? What-goes-to-what? photo 2: Modern CEV handlebar switch. photo 3: The wires which normally are soldered inside the metal switch. 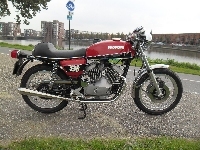 (Other colours, this is just an example). photo 4: This comes out of the modern switch. One of our clubmembers gave me a handwritten diagram. I tried to simplify this diagram (see below). Both ends (photo's 3 and 4) have to be connected in the correct way. 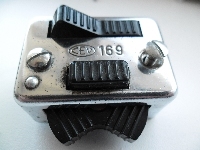 CEV switch 169 to the new type switch unfortunately was WRONG!! Please do not use it. 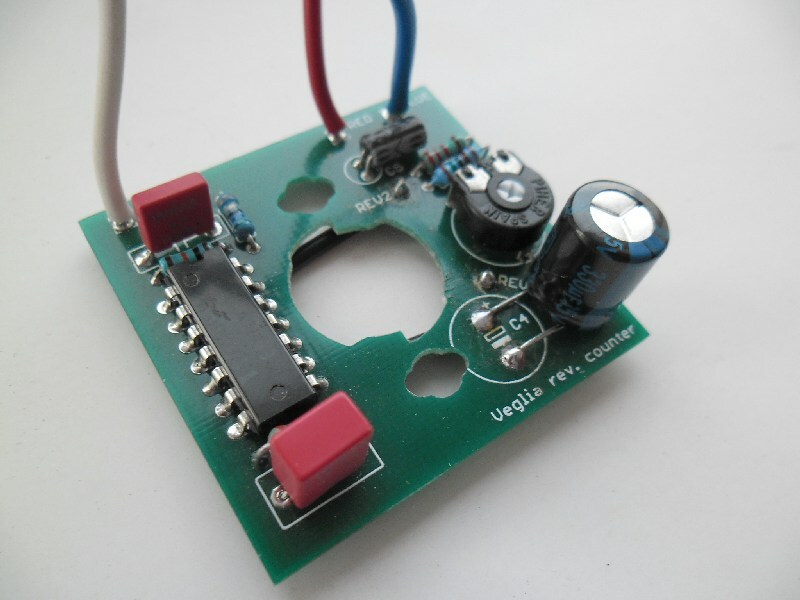 Of couse I have checked the new diagram with a multimeter and it was spot-on! Now it's simple to connect this new type switch to the existing wiring. 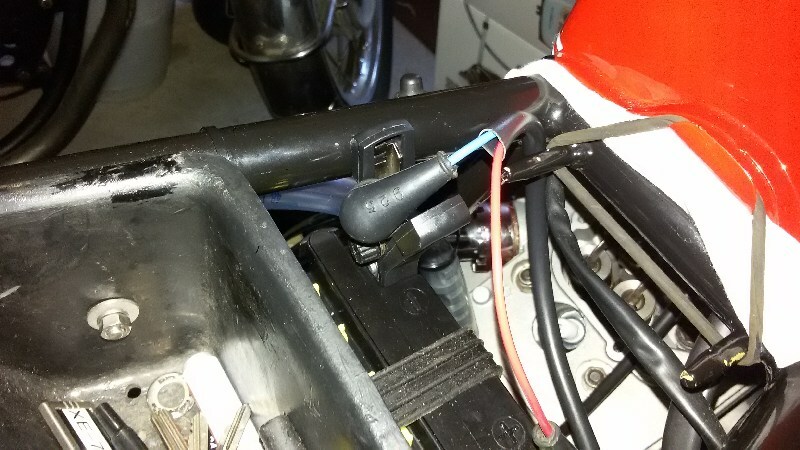 Rhs a picture of the multiconnectors between the CEV handlebar switch and the (regular) wiring harness of the bike. 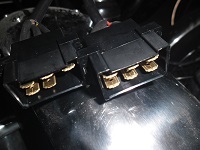 Bought these connectors from Rick Donkers, see type MC6B. 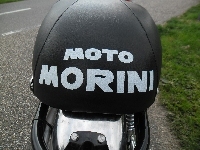 Nice detail: mid-March I found an "M" camshaft in Italy!! 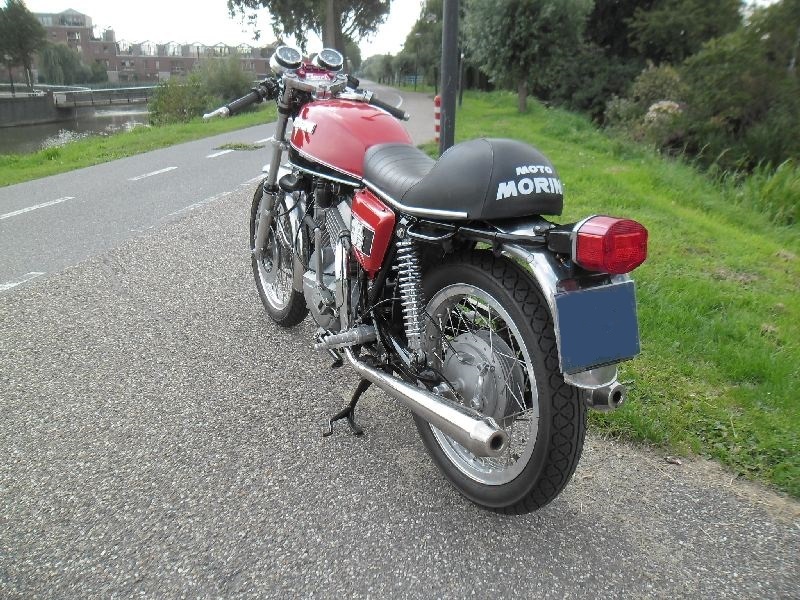 This cam gives the motor a character between the Touring and the Sport. 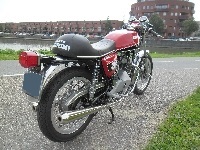 It was used in the "later" 350cc engines of for example: Kanguro X2/X3, Excalibur and New York. 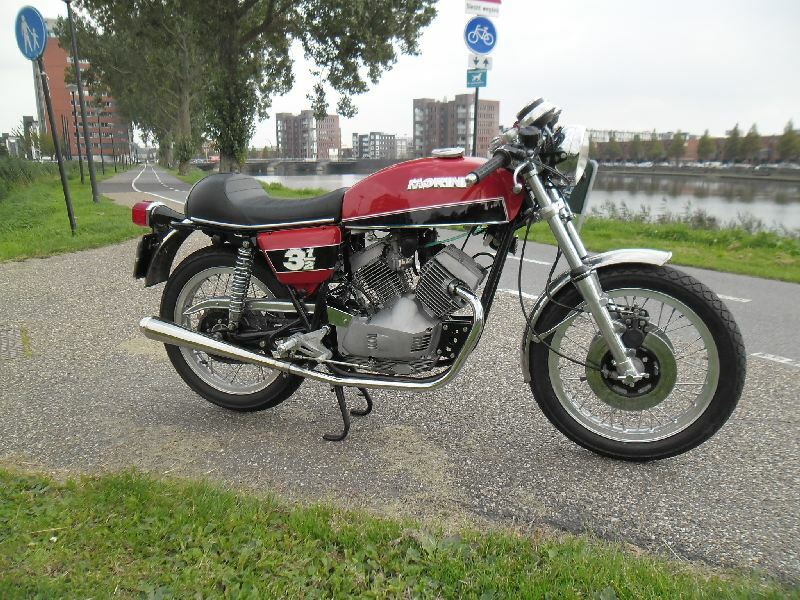 My new, but used M camshaft comes from an Excalibur, according to the seller. 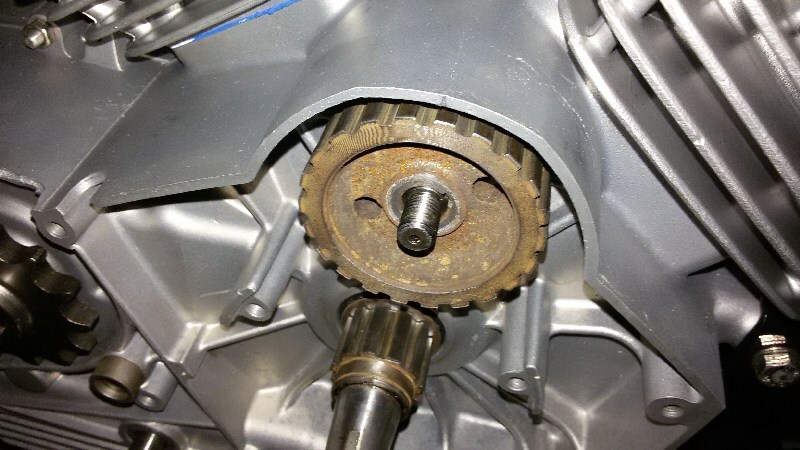 It gives the engine a little more push :)) More about the different camshafts and their timing can be found here. 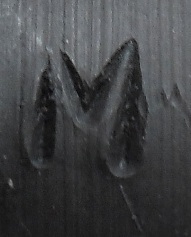 Above, the M camshaft and on the rhs a detail picture of the stamped-in "M". On the camshaft a little left from the center, you can - just about - see the M.
Rebuilding the engine goes well! 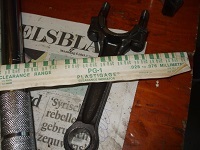 The play of the big end was measured with plastigage as shown in the workshop manual. The play can be measured with the flattenend strip of plastigage. The play is near enough new. 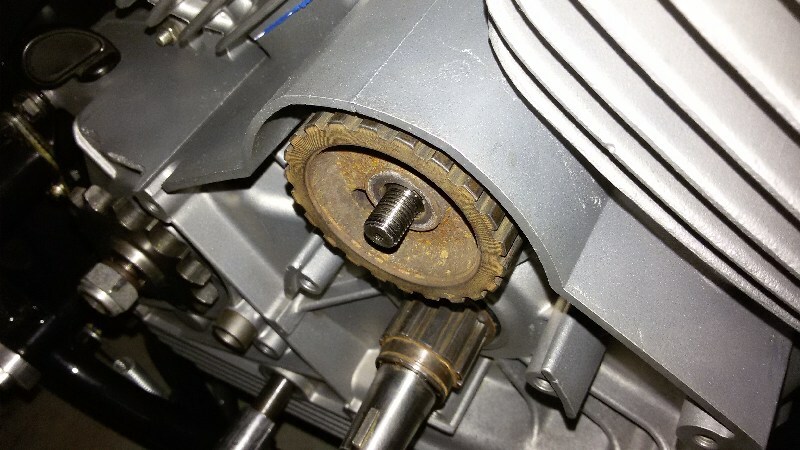 Also the play between both connecting rods was fine. 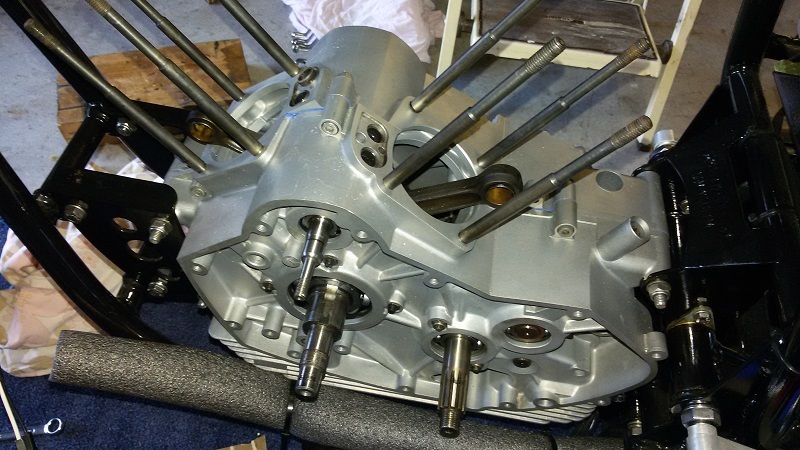 Below the brandnew 66mm pistons. 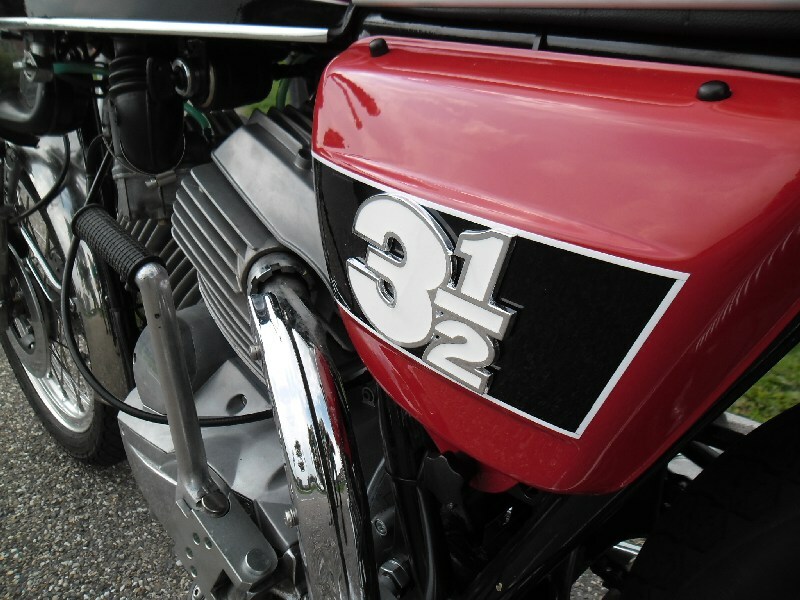 With these, the engine capacity is increased from 344cc to 390cc!! 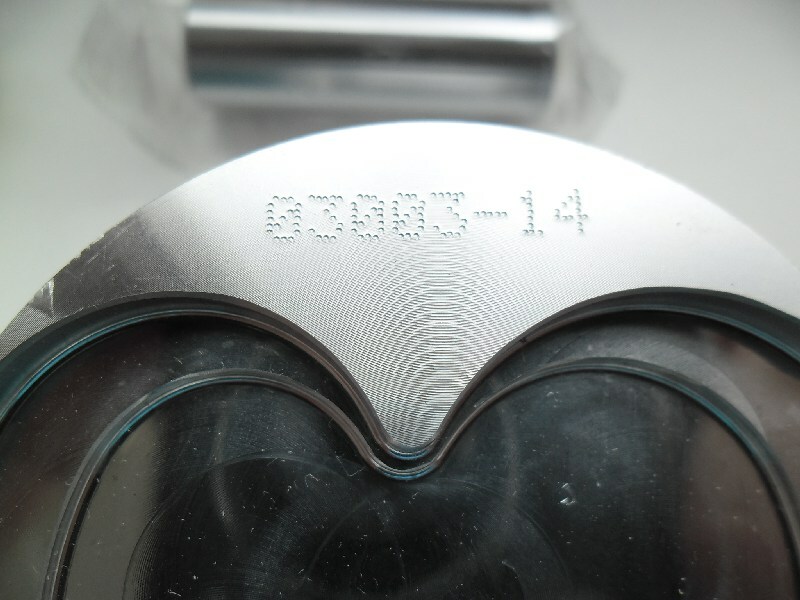 These pistons come in a set, they have consecutive serial numbers. 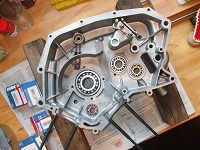 Above, new bearings in one half of the superclean crank cases. 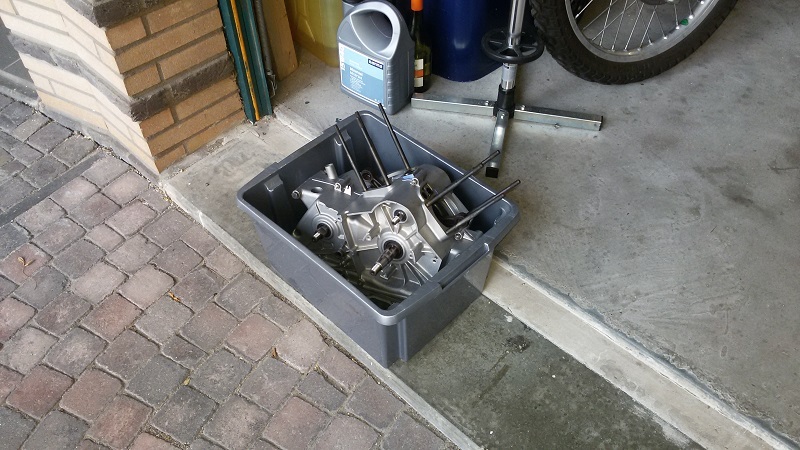 It was difficult/impossible to slide the crankshaft into the new bearing (it was difficult to remove the crankshaft from the old bearing), but after some four days in the freezer, it just plopped-in. 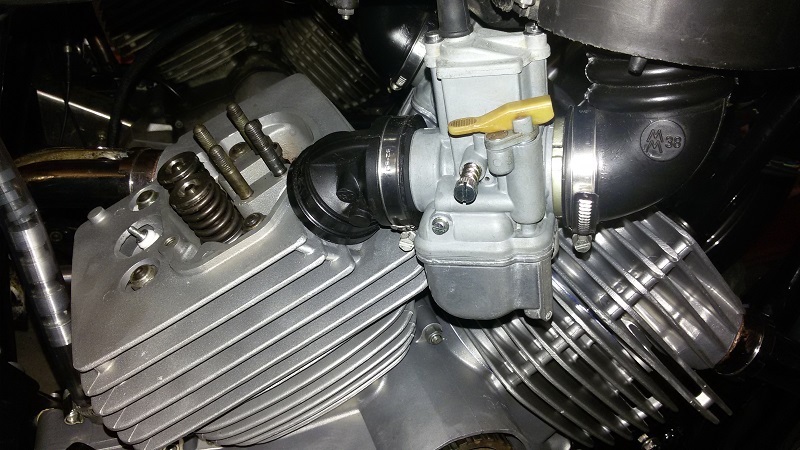 Engine can now be closed. 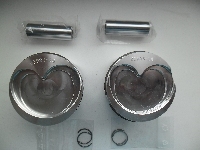 The bearings on the lhs are new too. size. 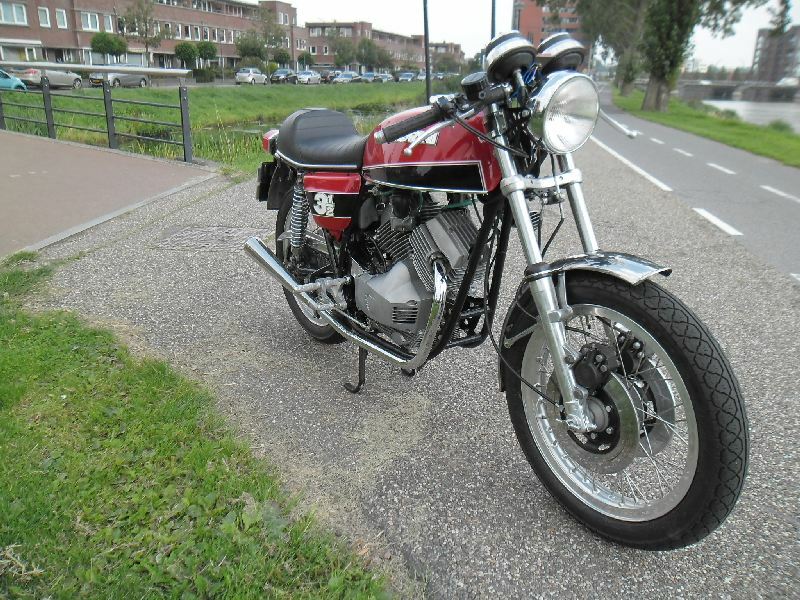 Also to not extend 5,000rpm the first 500km's and to avoid the same rpm. Why 0,07mm? 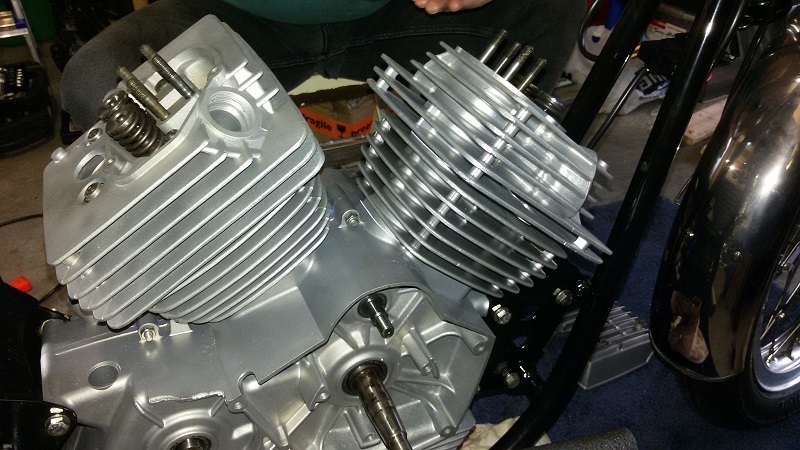 Aparantly every 10mm of bore should have 0,01mm of freeplay. 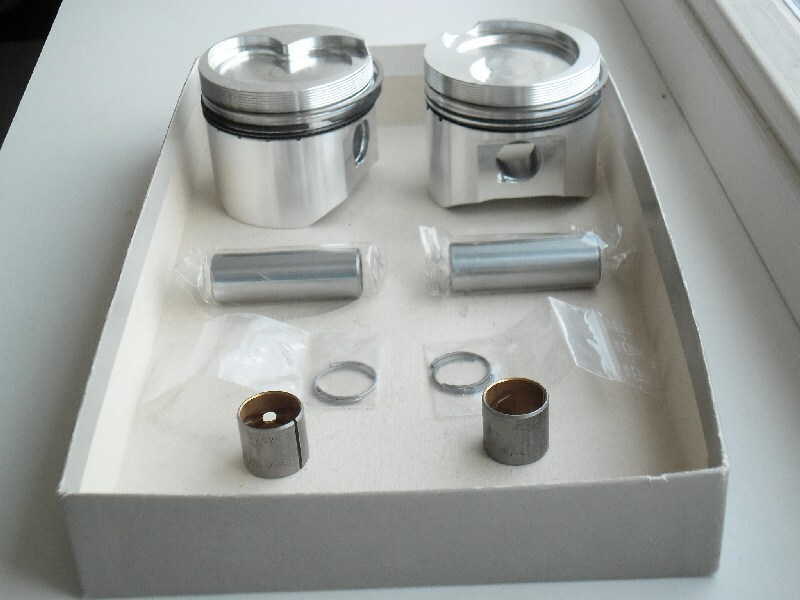 So these pistons with a 65mm diameter should have 6,5 x 0,01 = 0,065mm freeplay which is 0,07mm. 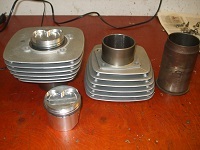 Top: topview of the new pistons, new piston pins and new clips. 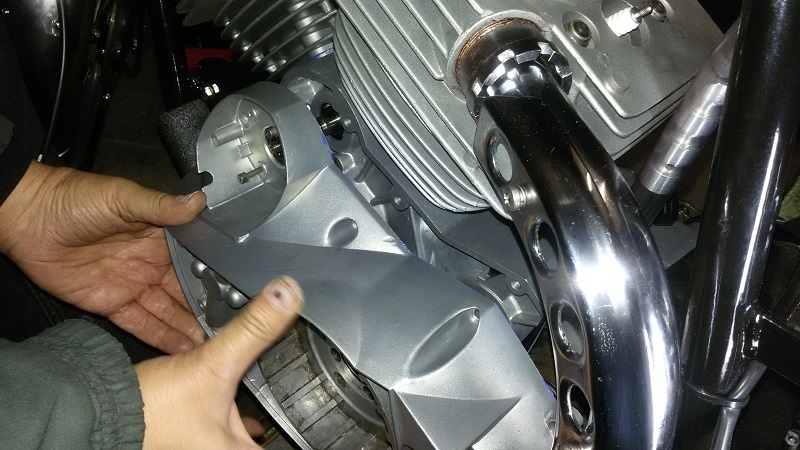 Top: on the foreground the new bearings for the connecting rods. 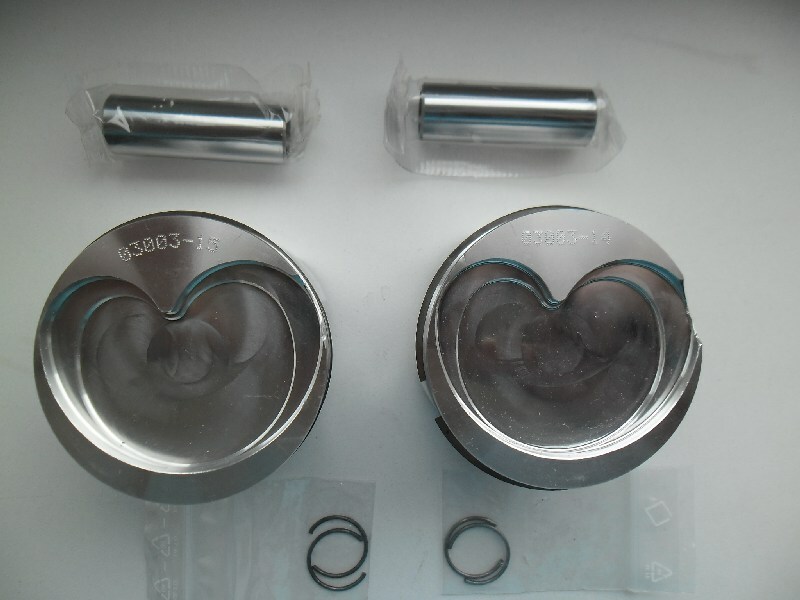 The bearings go into the connecting rod, the piston pins slide into these bearings. 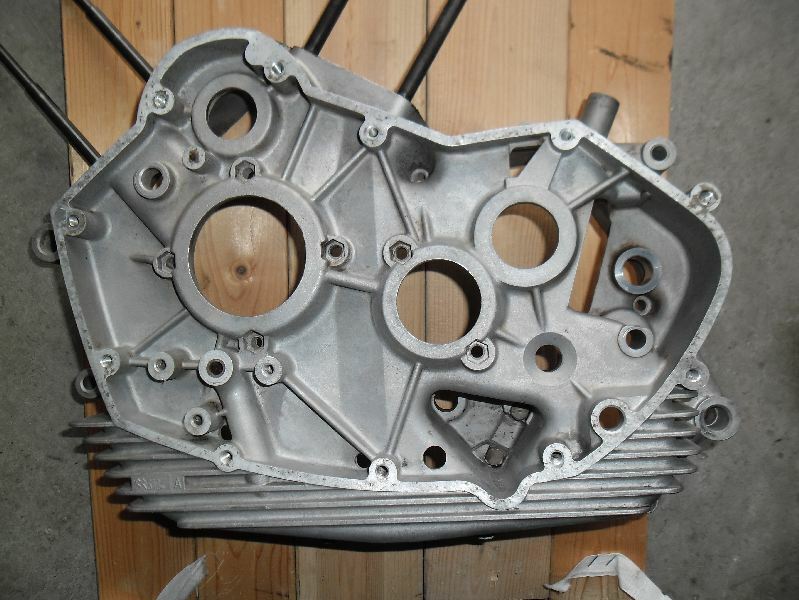 top of the cylinder - of course - is flat. 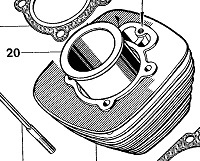 ...you can see such a cylinder liner of another cylinder. 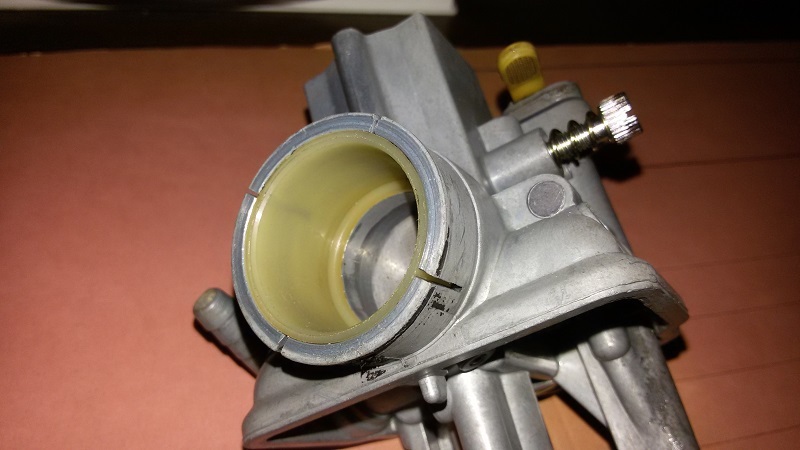 (This particular one was pressed-out of a 3rd cylinder and was put down as an example). After the rebore, the conical end became so thin that it had to be cut off (!). 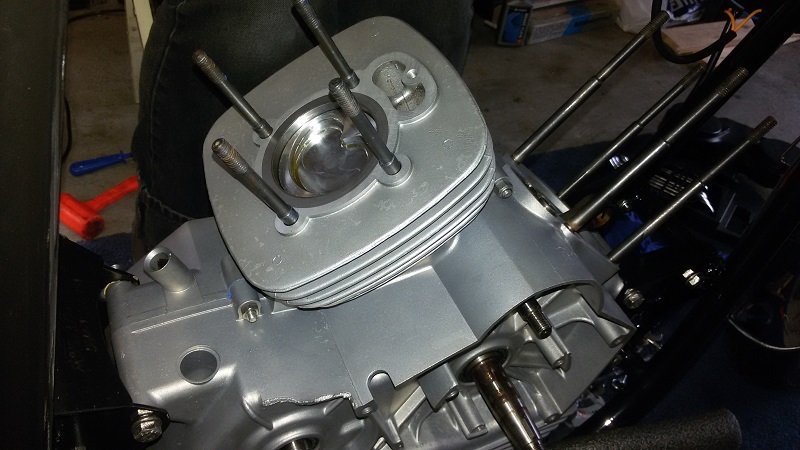 Next, a small edge had to be cut on the inside in order to enable the thin/brittle pistons rings into the cylinders. Cutting of that small edge was done on a lathe. 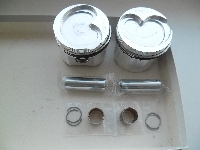 Both cylinder liners are now about 1cm shorter (and inside diameter 3mm wider). 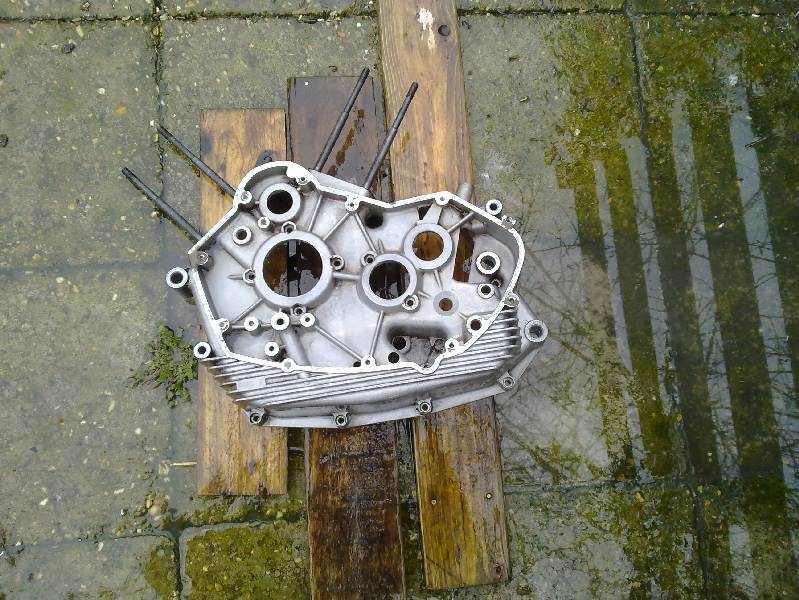 Fortunately no problems, as all fits perfectly, because the new pistons are shorter as well. 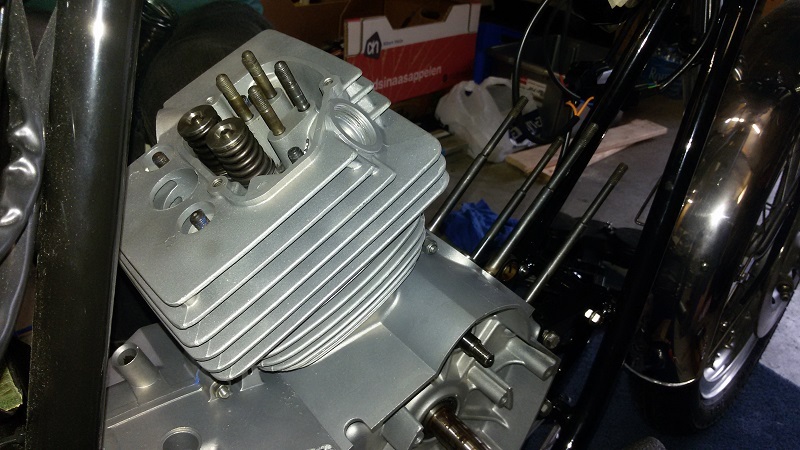 October 2014: Finishing the engine! Houston, we have a small problem: the new piston pins are a little heavier, 5 to 6 gramms each. Not much you would say, but at higher revolutions of the engine, vibration of the engine will be heavier. 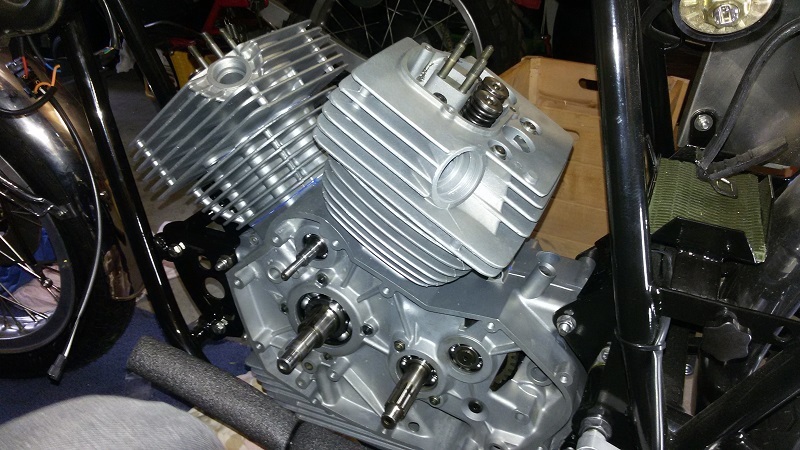 The lower part of the engine back together again!! 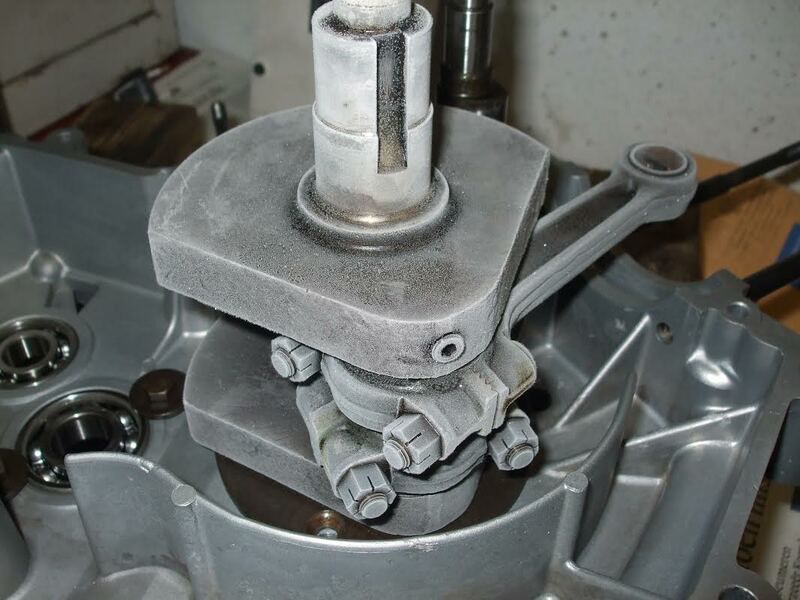 to be in good working order: important the shafts rotate!! 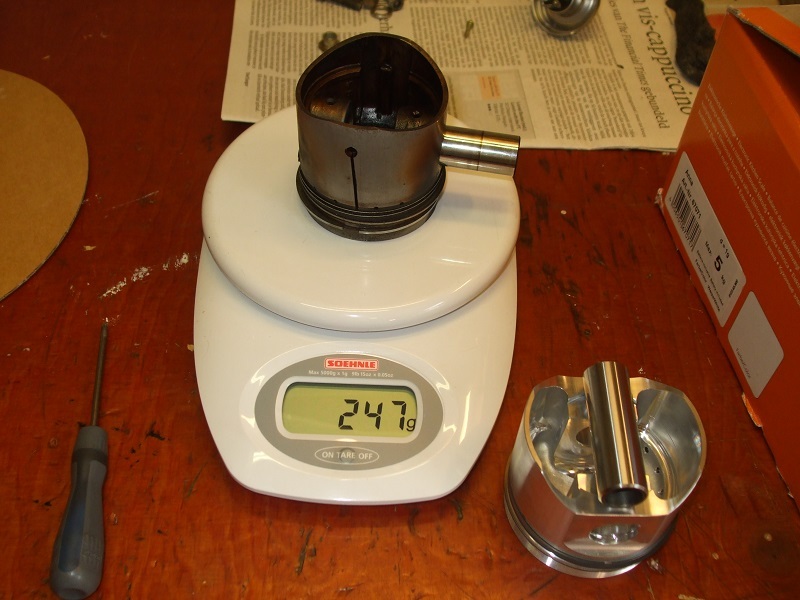 At first it seemed like a (small)problem had to be solved: the new pistons and piston pins have got a little more weight (+6 gram). 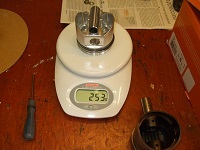 On the lhs photo the old piston and pin 247g, while the new set has got a weight of 253g. Good news of the supplier: the little extra weight is within tolerance! 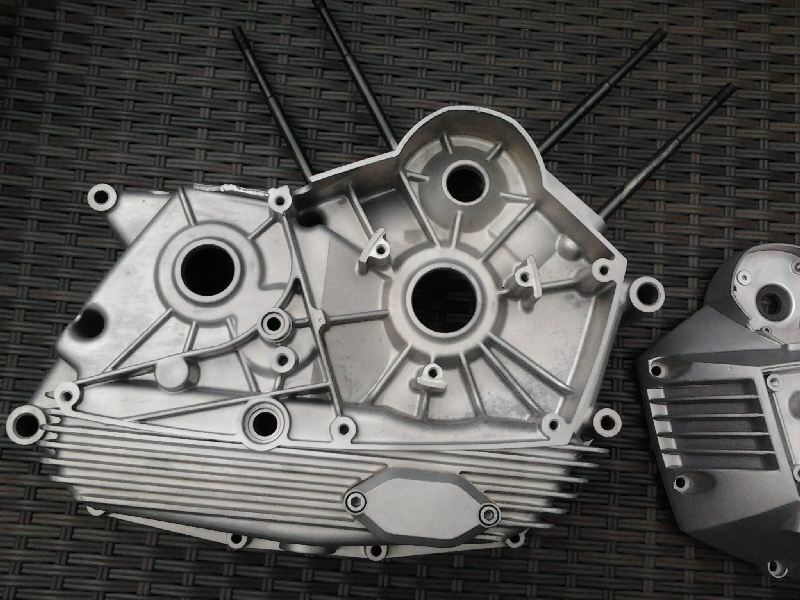 Meanwhile in Germany an x-number of 350 Sport bikes ride along without any problem with these pistons. Of course the carbs were cleaned in an ultrasonic bath. After that a pretty straight forward job to replace the inside parts for new, like all jets, the needle in each carb., the clip for the needle and the gaskets and gasket rings. 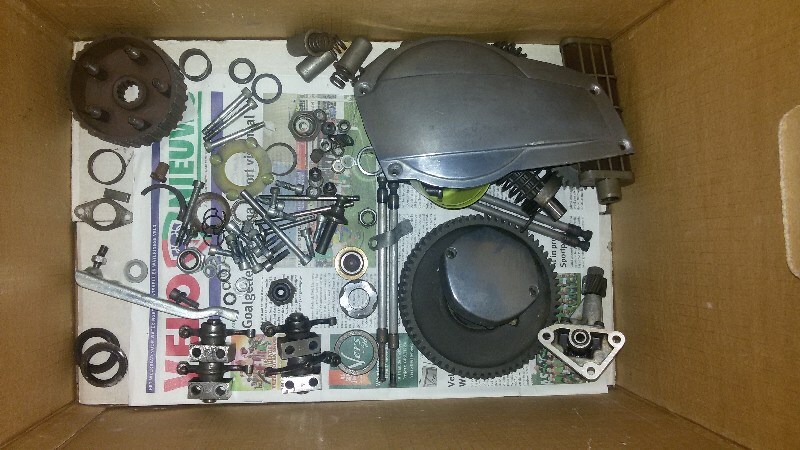 Fortunately, all these tiny Dell'Orto parts are still available! Rhs: schematic overview of the VHB carburettor. 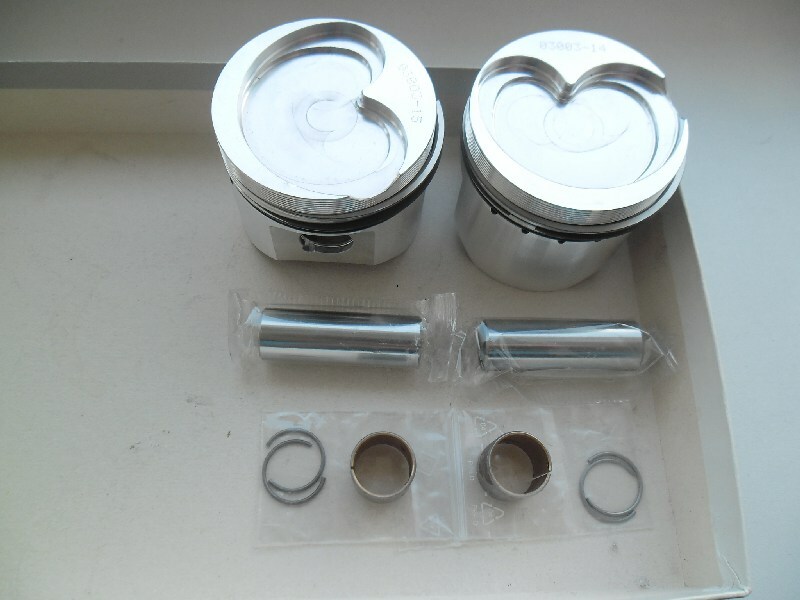 Main items on this picture: 1=slide, 2=needle, 3=atomiser, 4=main jet, 5=idle jet, 6=choke jet, 21=mixture screw, 22=idle screw, 30=fuelsieve, 33=float needle. The black part is not Dell'orto, but a specific Morini part. I found a pair 'new old stock'. Generally difficult to find. 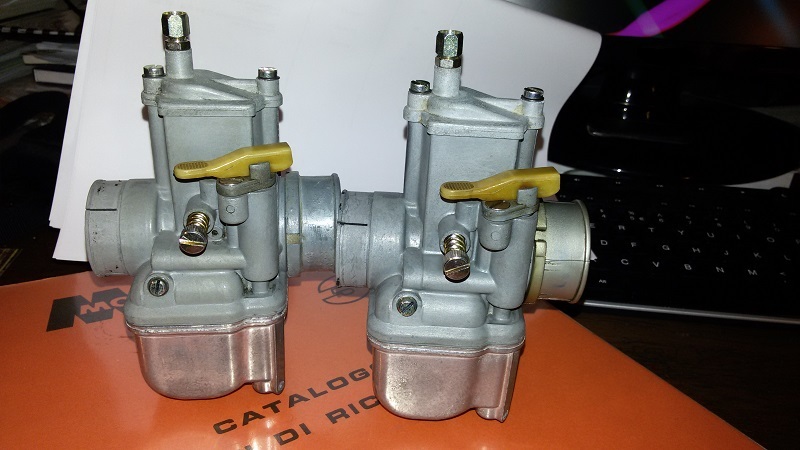 These rubber sleeves (location between the Dell'Orto carbs and cylinderheads) are brand new. 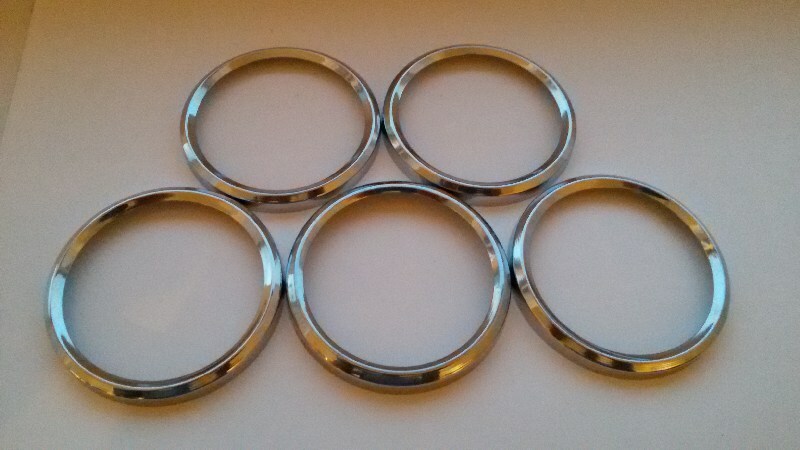 The extra ring (lhs) is new also. It's a specific Morini part, new old stock and difficult to find. Tools ready for the job! Tools, ready for the job! No comment :)) Just a very big smile from yours truly!! 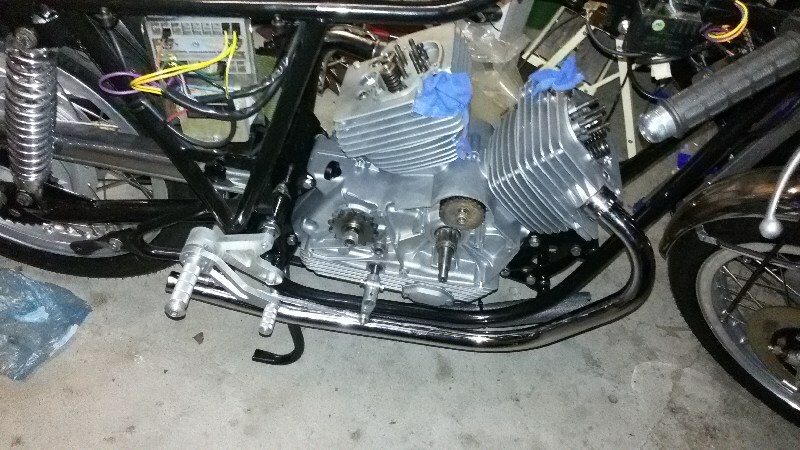 Careful, clothes below the engine to prevent scratches on the frame. 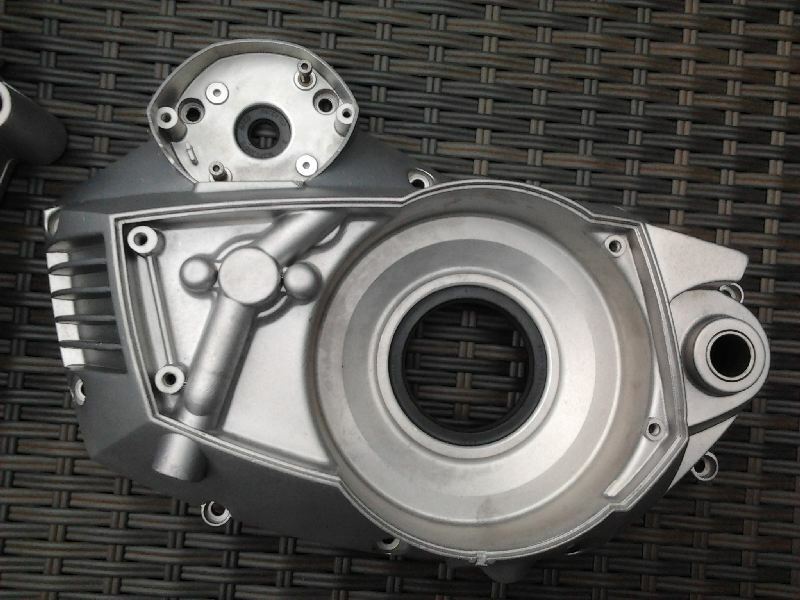 On this picture, a good view of the new Heron piston. The hart shaped sunken top of the piston is the combustion chamber. Cilinderhead in place. 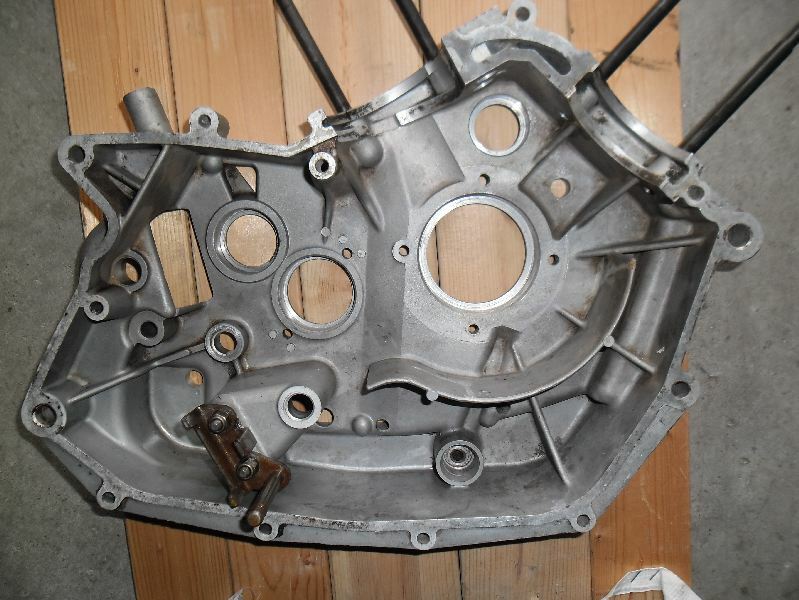 Torqued first with 2,8 mkg, after 30 minutes loosend and then torqued with 2,2 mkg, according to the factory workshop manual. New head- and foot gaskets. RHS, now with both heads in place. Closed the "holes" with cotton cloths to prevent rubbish getting into the engine. Lhs: smaller parts after a wash in a cold cleaner. 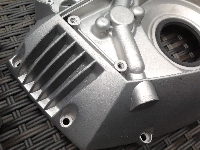 The aluminium covers were washed but they still had to be polished on the outside. 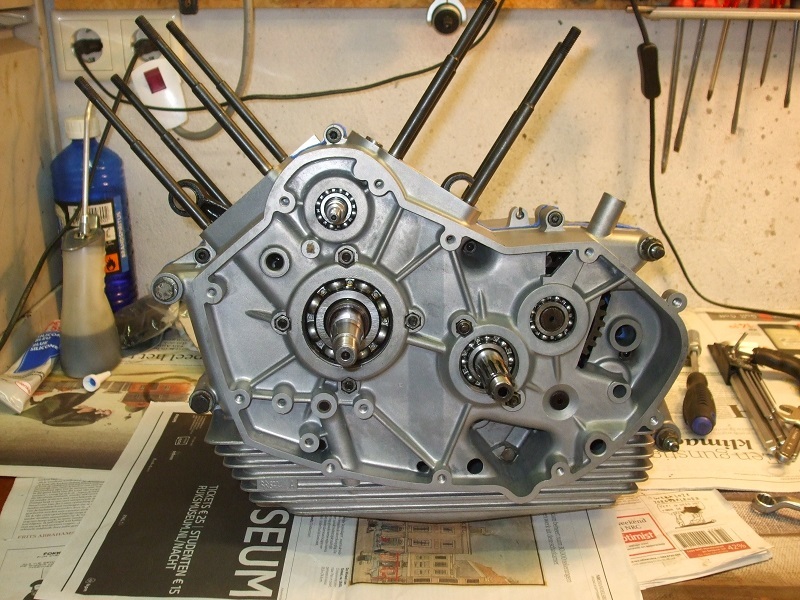 On the picture: top lhs: clutch basket, rhs top: oil filter, rhs bottom: oil pump with a new O-ring. 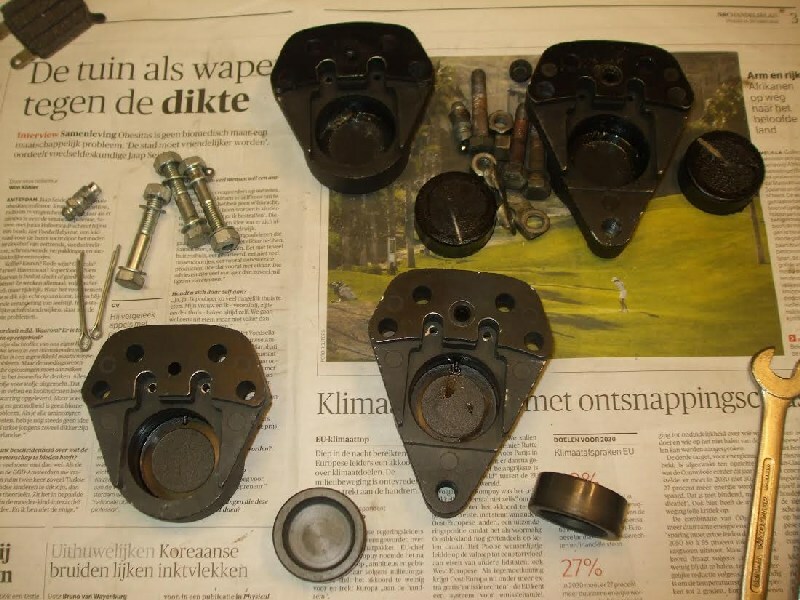 The brake calipers overhauld. One was new anyway, the other one in an excellent state. Lhs: on these 2 pictures the primary gear is back in place. 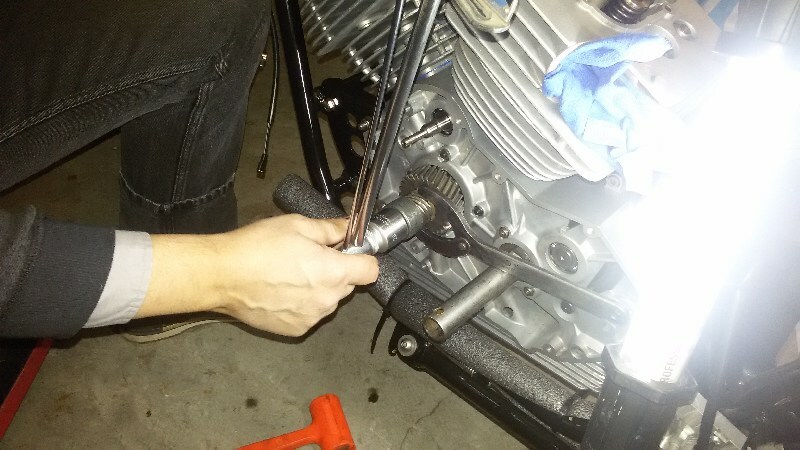 According to the workshop manual it is set with the right torque. The top- and bottom cogwheels, in between (later) the cambelt and over it (later) the alternator with flywheel. 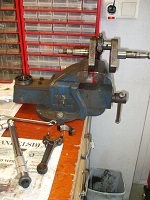 The rod between the shift peg and engine gearchange axle. Rhs downpipe in place. 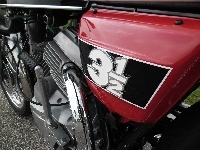 Below the engine there is a 'balance' pipe between both downpipes. Lhs downpipe. 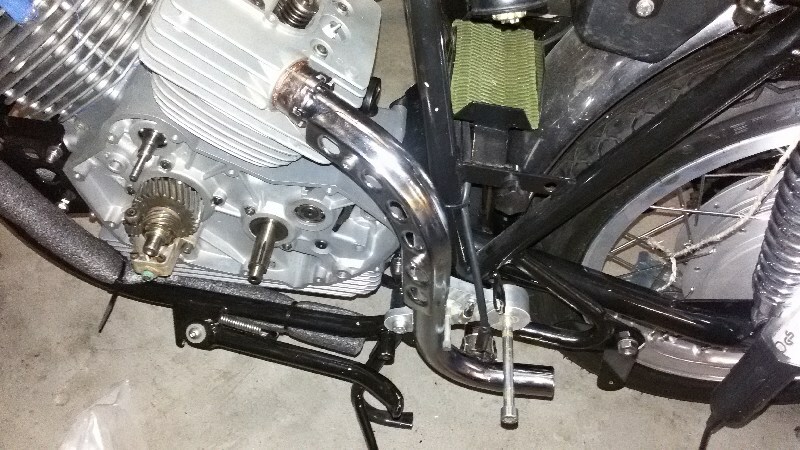 The balance pipe connects (under a right-angle) both downpipes. 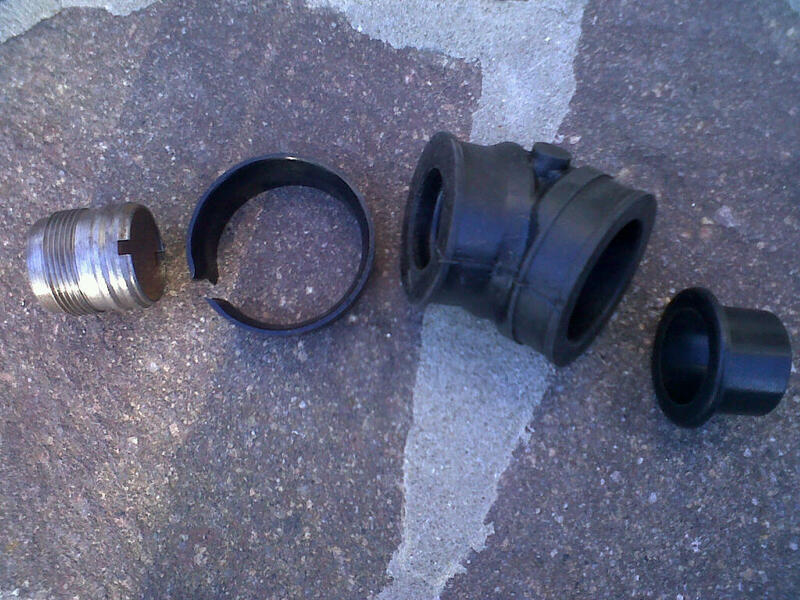 Left-to-right metal bushing, nylon ring, rubber muff, black nylon bushing. The metal bushing screws into the cilinderhead. Rubber muff is fixed on it. Nylon ring around it. 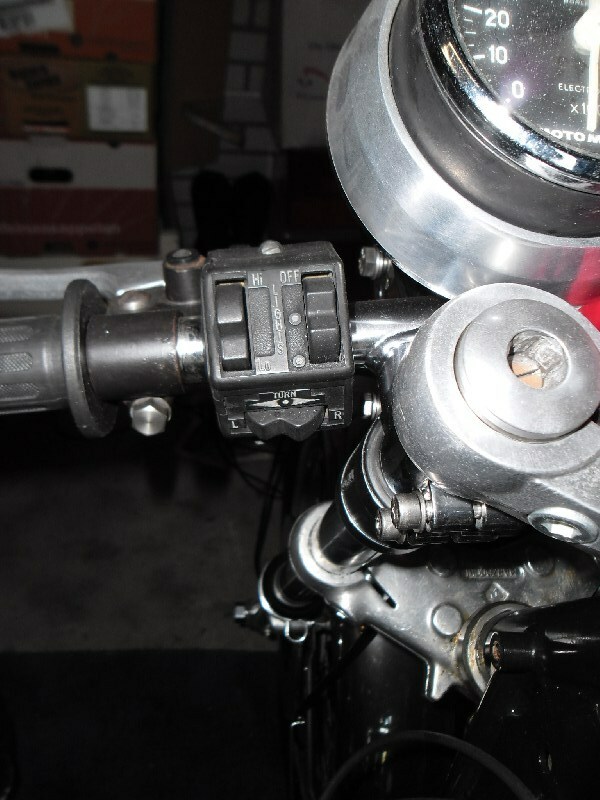 Stainless hoseclamp closes off. 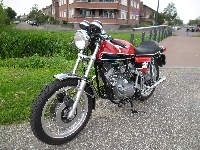 On the other side of the rubber muff, the carburettor is conected. 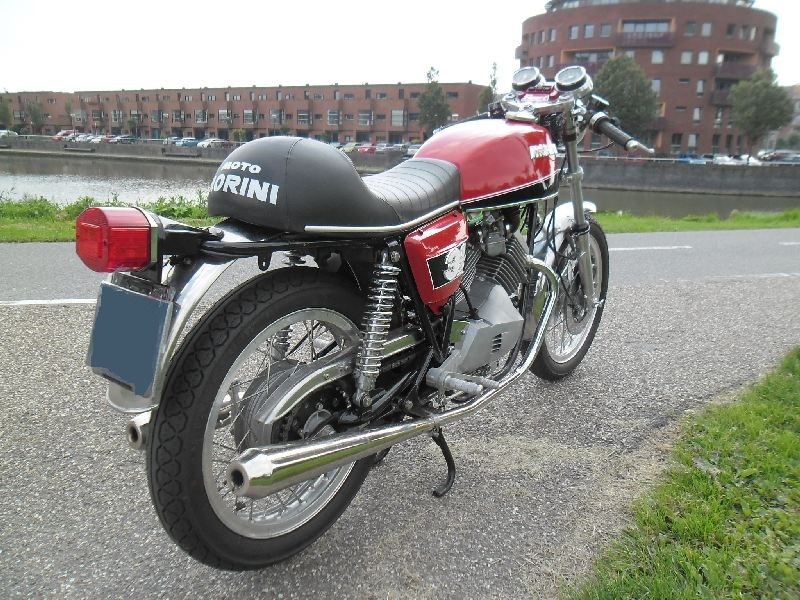 The black nylon bushing (rhs) is a Morini part and is shoved into the carburettor. 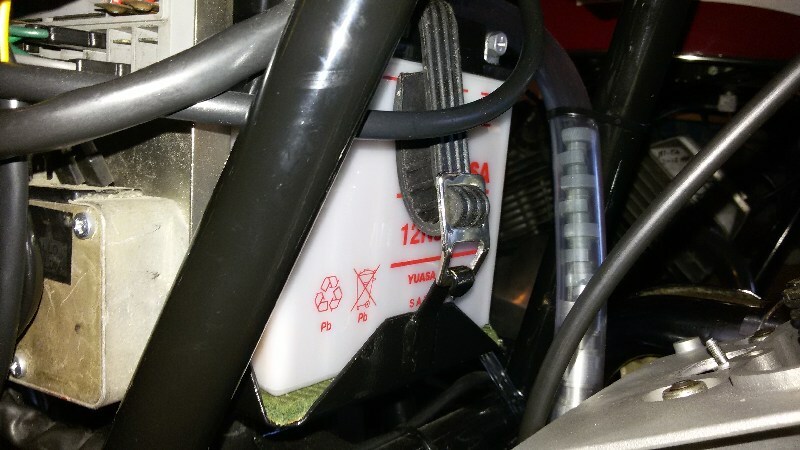 On the rhs photo, far right the 'elbow' to the airfilter. 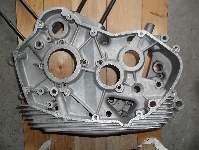 Blue Loctite gasket on the lhs engine cover. 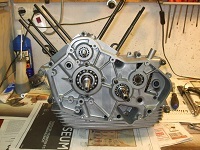 The large (secundary) gear on the inside is connected to the clutch basket on the outside of the cover. 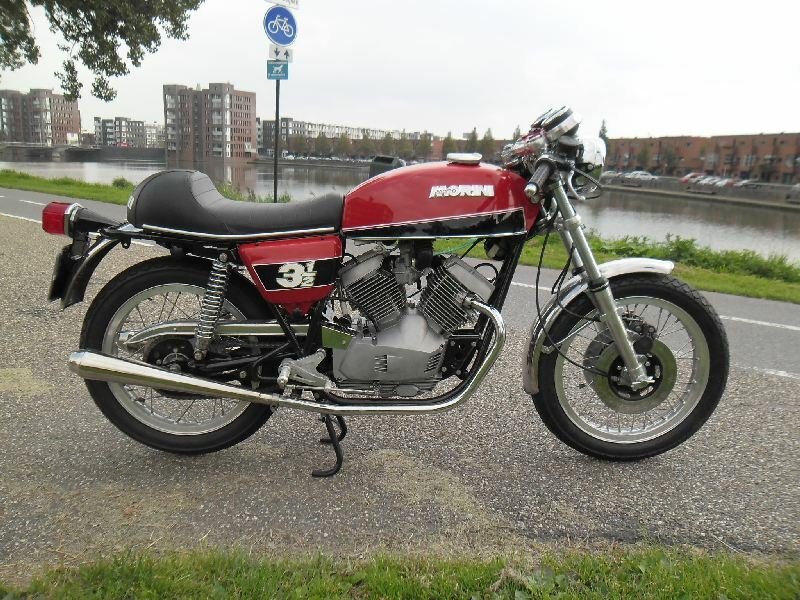 The Morini has got a dry clutch, like many racing bikes. It prevents pollution of the oil. The cover nearly in place. 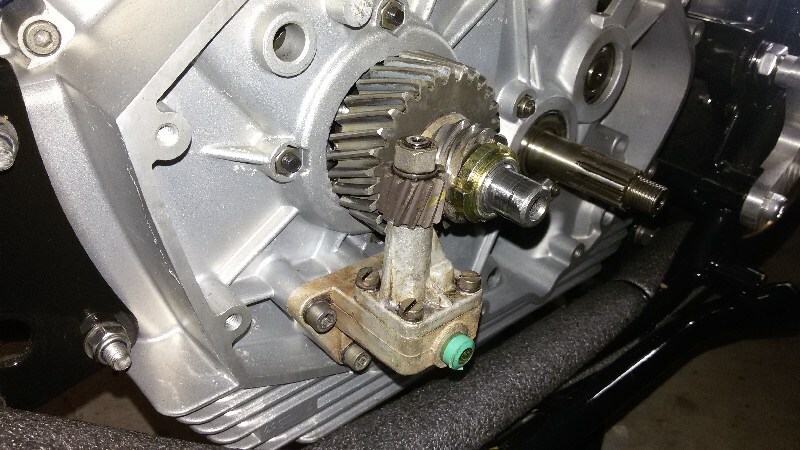 It is hiding the kickstarter axle. 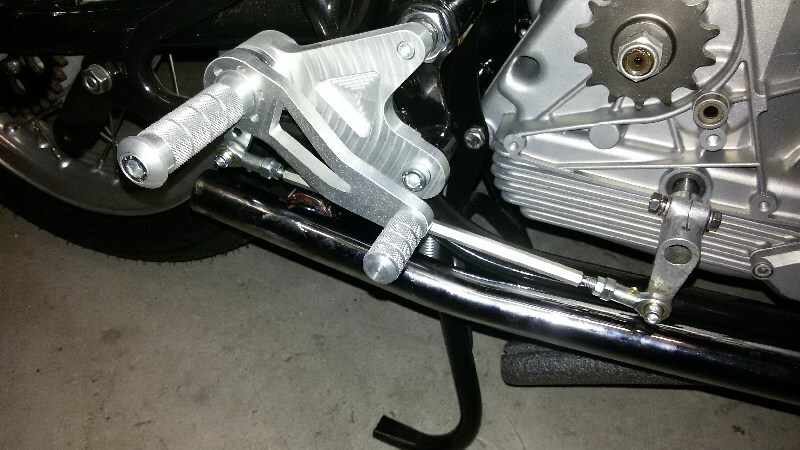 The kickstarter axle is temporary held in place with the help of some tie raps. Just before the cover is in place, the tie raps are cut and removed. 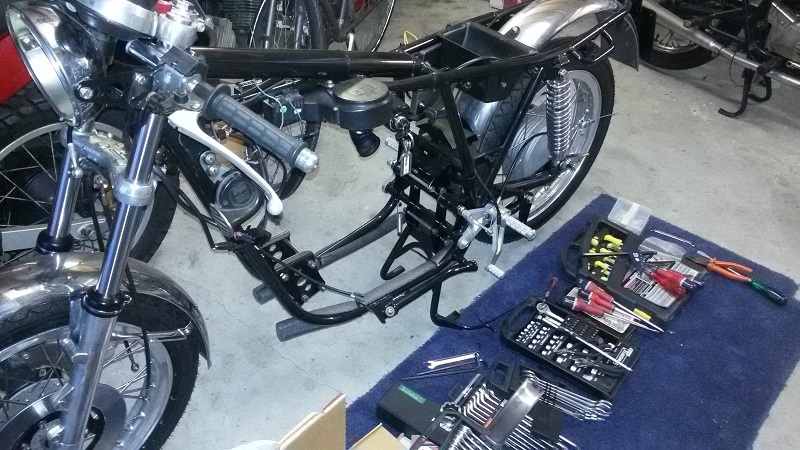 From the above row, I have started to check the electrics. 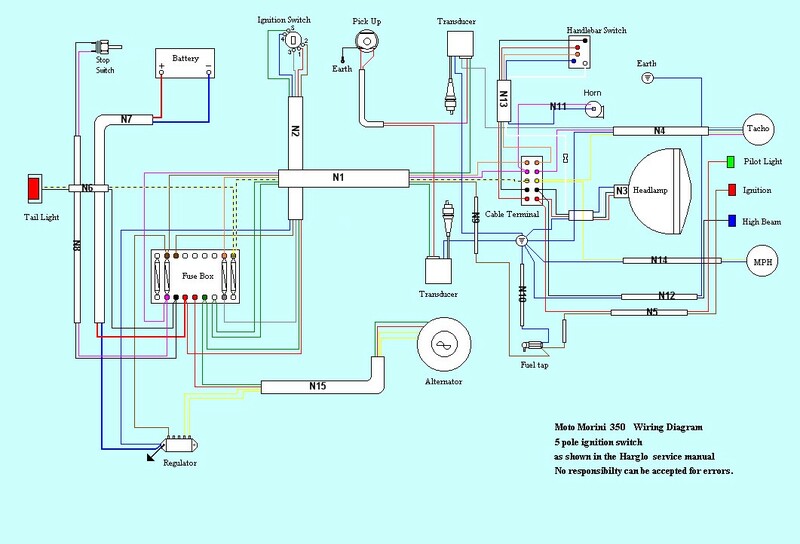 Don't forget, I had to build a complete new wiring harness. Also the lightswitch is of a later model bike. It's easy to make a mistake in one of the many connections. Fortunately there are fuses in case of an electric emergency, but still it is exciting to see if all works well! Exciting for a short moment: smoke/shortcut, or not? Fortunately NOT! The electrics work perfectly!! 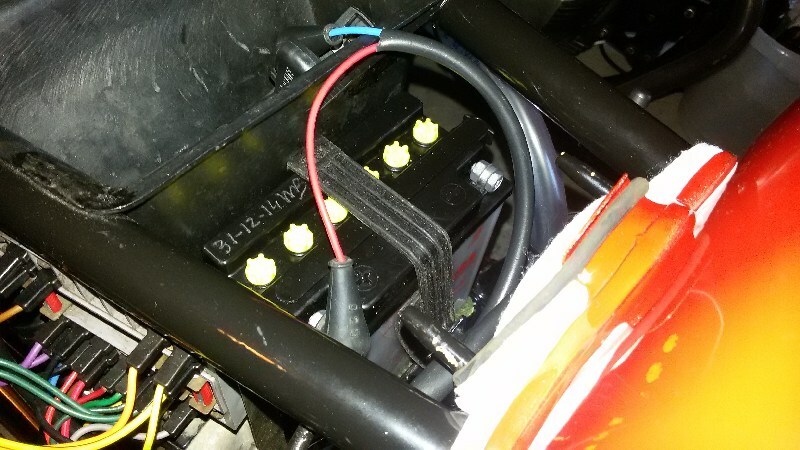 Front view: the fresh 9Ah battery. In the shop it was filled up with acid. At home I connected the battery to an automatic charger until it was fully charged. Top view of the battery. Above the blue cable with the clasp on the negative battery pole. 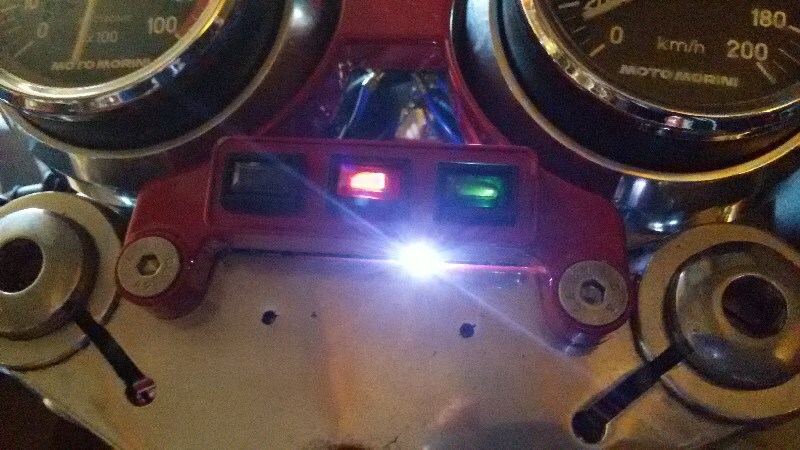 After switching on the ignition, the cockpit lights lit up normally: red: 'ignition on', green: 'lights on'. 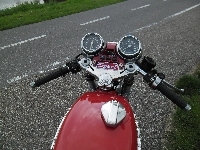 Blue for 'high beam' and also the rev counter and tacho lit up normally. 1) I noticed the original clutch cable was extremely stiff in the outer cable. After using plenty of teflon spray (not WD40), it improved a lot, but a new cable would be so much better. 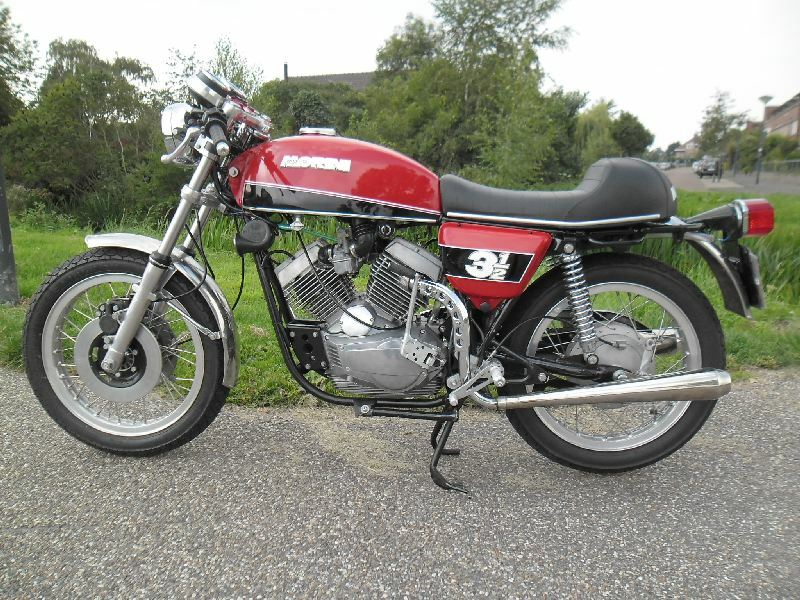 The right one to get is from Venhill which I found on Ebay. 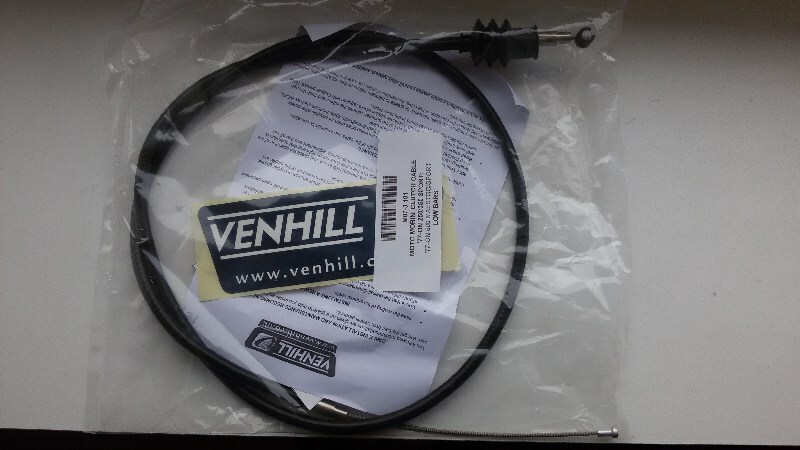 (Both throttle cables were already new ones from Venhill). 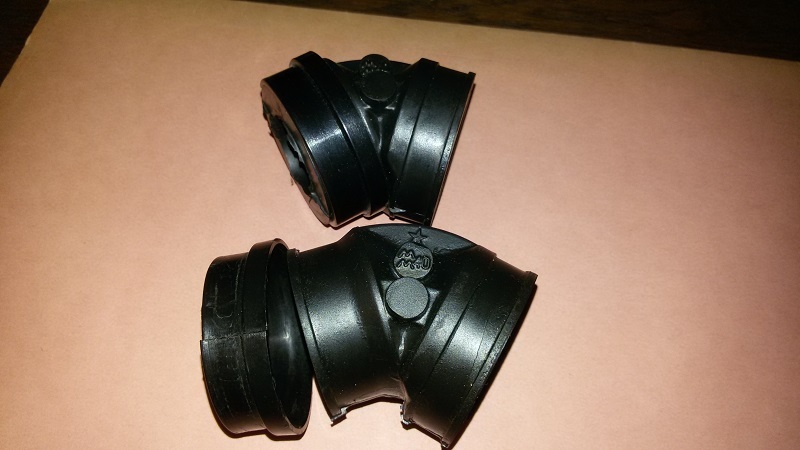 2) Both tacho and speedo are held in big rubber coupling sleeves. 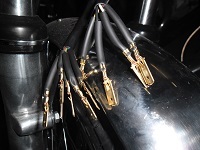 This means an extra earth wire is needed for the sockets of the small 3W bulbs inside these instruments. On one socket it was impossible to connect an earth wire. 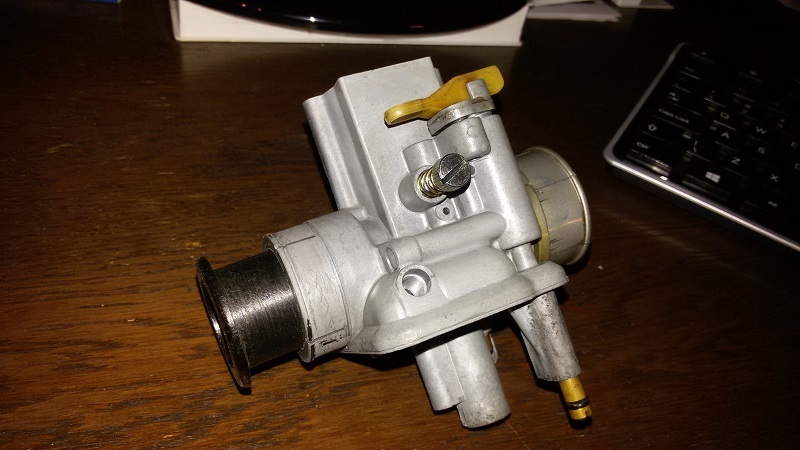 Fortunately Hans did have a spare one with 2 connectors, problem solved! Unfortunately the new (inner)cable is 15mm too long! After assembly, the kickstarter still did not rum smoothly. It skipped teeth when kicking down. It would not come up properly either. After some difficulcy, we took off the lhs engine cover. The spring of the kickstarter axle hooks behind a metal "mushroom". After installing the sidecover, you then have to rotate the kickstarter 360 degrees to put tension on the spring, so the kickstarter will return upwards after kicking it down. For some reason it was impossible to make the 360 rotation. My friend realised that there are 2 types of these mushrooms. 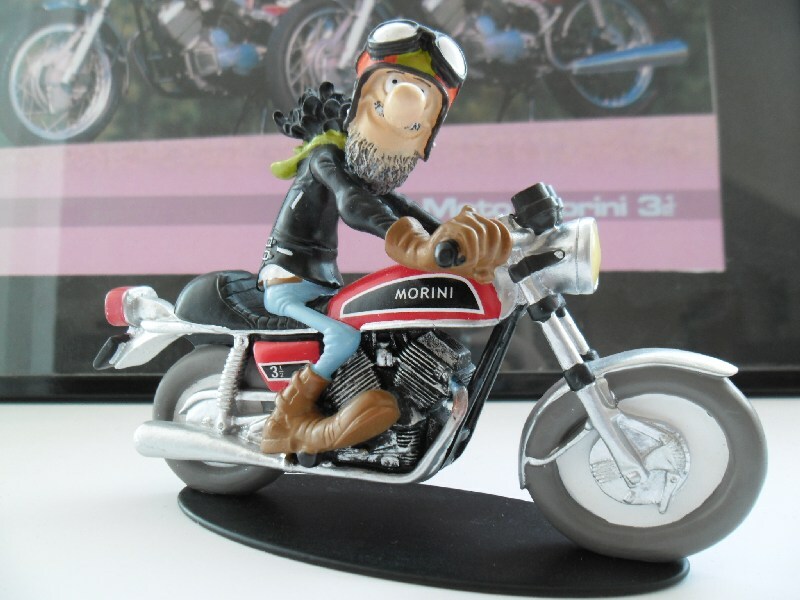 Fortunately I had the other model as well. We swapped mushrooms and tried again, ..... and it worked, but still not 100%. As we did not use a paper gasket (0,3mm), but blue Locktite instead we thought that perhaps that also made some difference. 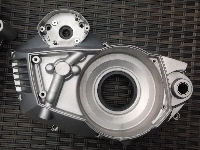 In the engine cover there is a hole for the kickstarter axle. In this hole there is a bushing. 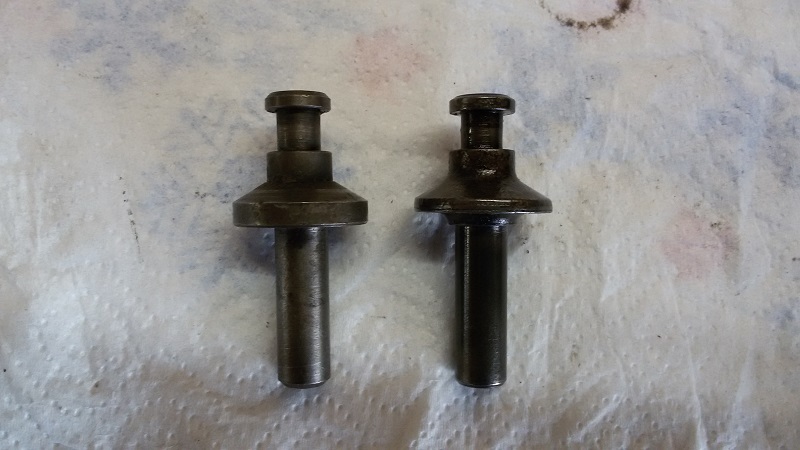 Using a pipe/hammer we knocked that bushing 0,5mm outwards. Then put the cover back and it was PERFECT!!! Kickstarter now works as it should: 100%!! 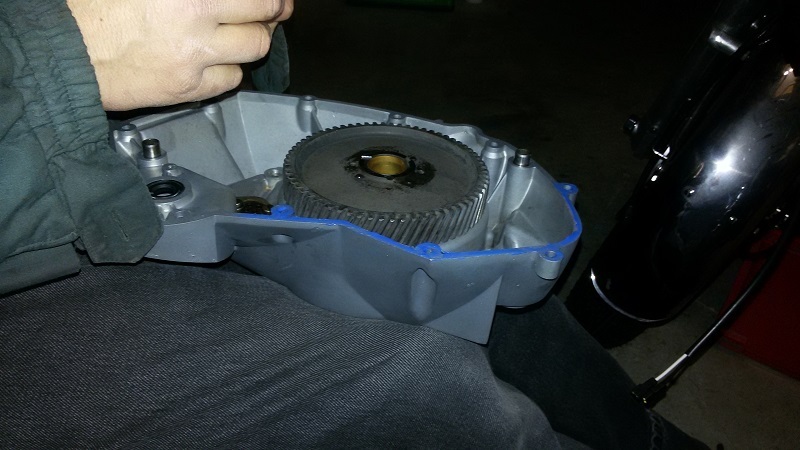 But, there was one more set-back: the clutchplates were slipping. I used a different set of lined plates, which gave some improvement. 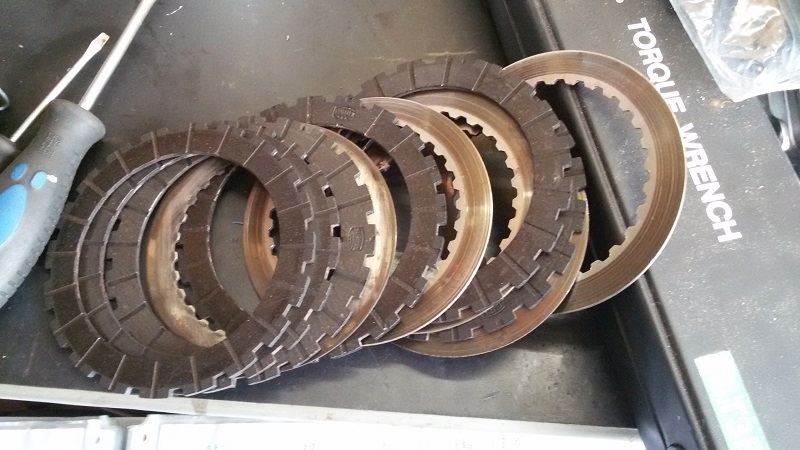 Next morning I ordered a complete new set, consisting of new lined plates, new steel plates, new springs, new bolts. After I received and installed the new set, the problem was solved. YES!! 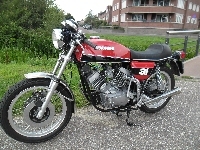 It's running! 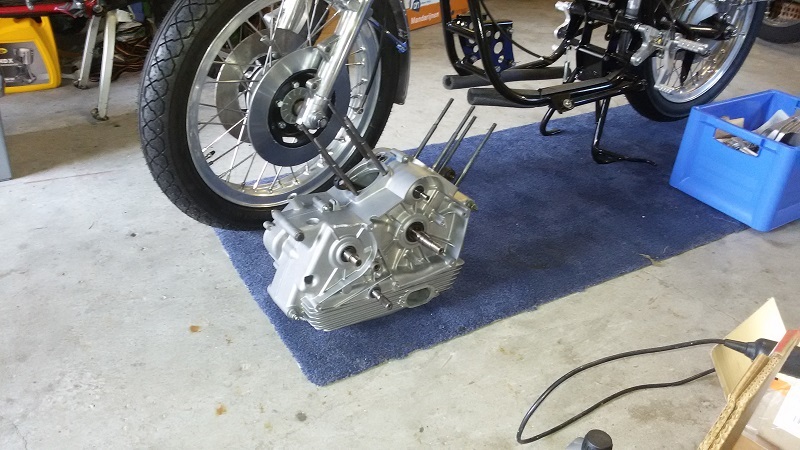 After installing a different ignition, the bike starts 1st kick! 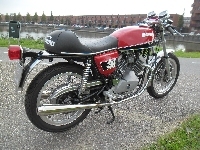 The first start attempt was - unfortunately - not succesful, despite sparks on both cilinders. 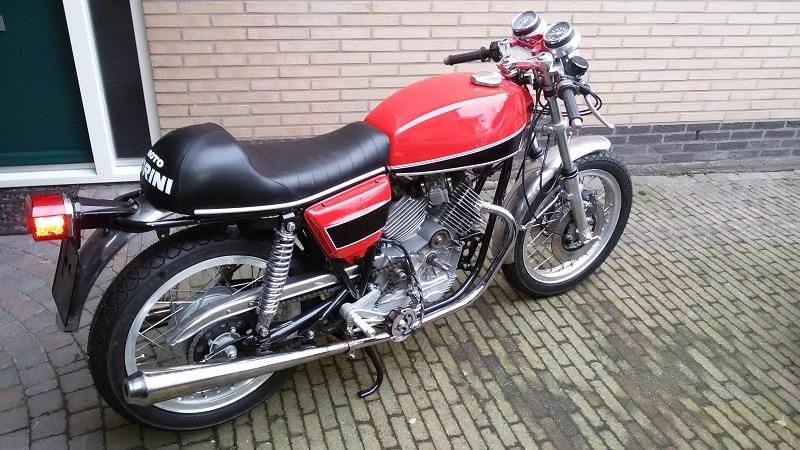 After swapping ignition parts like pick-up and transducers (parts which came from a running bike), the Sport started 2nd kick!! The YouTube film (above), was made of the 2nd start, the next day. 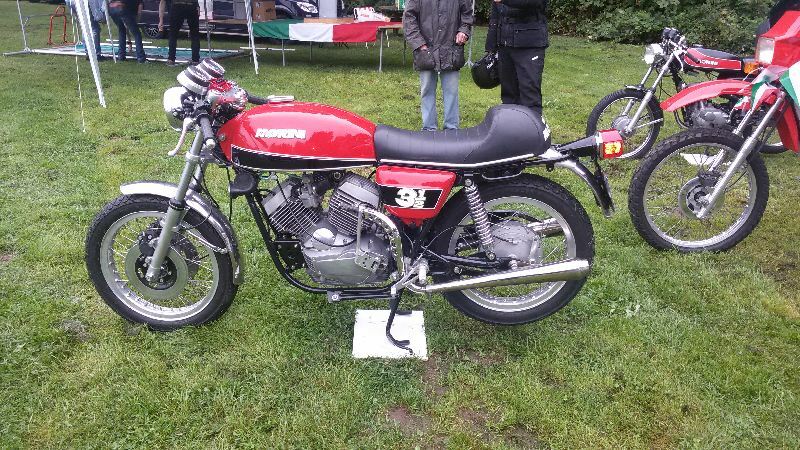 On the 16th of August 2015 I visited the "Ital Day" in Beusichem/Netherlands, the ultimate test-run. Exciting, but fortunately the 208 km's which I had to cover on B-roads gave no problems whatsoever. The engine sounds superb and accelerating out of a bend gives that fantastic v-twin sound. Really fantastic!! 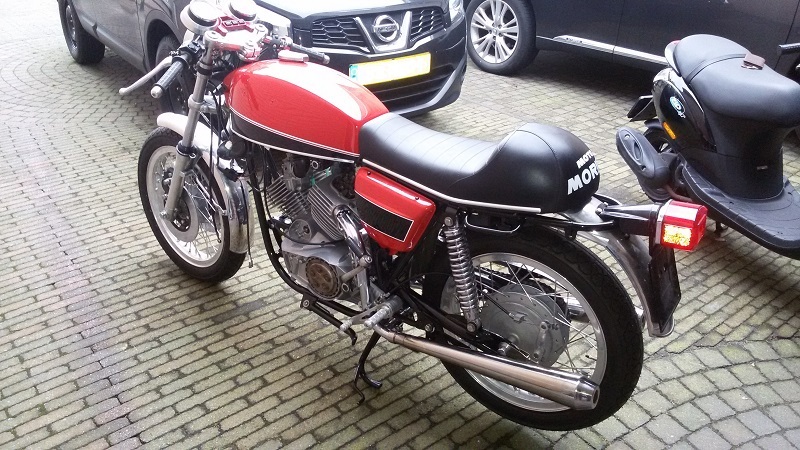 Finally, the restauration has come to a succesful end! Ben, Fer, Kees, Robert and Tom! Many thanks for your help and advice!! It was definitely worth saving this beauty, TK.